How many of you have seen or experienced a 3 month or 12-week training program that promises success? I’m sure there’s a high percentage of you that have experienced this or have family or friends that have gone through this, and some have seen success and others not. Now there is a caveat to those that succeeded in weight loss per se, but due to the lack of sustainability, they were not able to keep the weight off. In saying that, this particular blog doesn’t just specify only the weight loss client. This blog is also directed at athletes. In athletics, if the client’s been training for more than a year consistently, we could take 2 to 3 months to peak them for their competition. But if they show up 3 months before their competition, with no training background, after their general prep phase, they have 8 weeks roughly to build a specific adaptation that you’ll hope can bring the performance benefits. Let me break this down more so that you’ll understand that having trained as a lifestyle rather than a quick fix has way more benefits. Hopefully, this will change the way you look at training and help fulfill certain goals. The proof is in the pudding – Usually, I’d leave this for last but I believe that in this instance it needs to be stated up front. Science has proven that you can start seeing morphological body composition changes by 16 weeks. There is consideration of course. For example, this is if you were to complete 4, 4-week phases of minimum 3 times per week. This doesn’t even consider your daily diet for 16 weeks, because as we all know, following a healthy diet is also a key to the success of your goals. Throw in good sleep habits and recovery protocols and you’re well on your way. Consider these points when going to a trainer 8 weeks prior to your Mexico beach trip or competition, and you haven’t trained all year, maybe the 3 months you take on should be with someone that will steer you in the right direction and use this as your first training block with assessments in place. 800 Cal and 800 reps – So this is a continuing trend in the fitness industry, and I think it’s for two basic reasons. I think the first obvious reason is the money of course; if there is a promise made to be shredded in 12 weeks, in some cases or your money back, then they have to provide the service to comply with the promise. The second reason I think is to keep up with trending social media biases. Unfortunately to make that promise comes with hard sacrifices and a dietary deficit. I’ve had clients come through my door in the past stating that the last trainer had them on an 850Cal a day dietary intake yet they walk in 20Lbs over their desired goal weight. And to add insult to injury they were on some ridiculous HIT training programs and high rep “strength training” that usually come with an added sprinkle of repetitive strain injuries and soft tissue damage. Did my client meet her target at the time? Absolutely! The trainer got paid and kept his promise, and possibly even got a before and after for Instagram. Unfortunately, this came with a cost; a hypoactive thyroid, and homeostatic imbalances, as well as double the weight back. When she came to me she needed help and after a year of training and fixing on the way, she’s maintaining her goal weight and much happier and active. Adaptation – That’s right, an acute adaptation to an imposed demand. when someone asks a coach what that particular athlete is training for, we don’t answer, “to make him/her faster, or stronger.” We train them for a specific adaptation that can be at the time of the phase, faster, stronger, an energy system, or anything specific to a training phase within a training block necessary to their sport. This means that it is in the athletes best interest to continuously be training, rather than show up to a coach’s door 8 weeks prior to a competition. Of course please take into consideration that as coaches we hope to know that the athlete is training their sport at all times; this helps us clean up a bit of the body rust faster and stay focused on the sports specific. If the athlete is training consistently then it becomes much simpler to program their peaking phase for competition. Injury prevention – This is one of the major reasons we train athletes and or the general population; to stay healthy with training that reflects that. Let’s breakdown another reason why the 3-month shredded program is a fail. Any type of training has physical as well as neurological demands. Therefore the shredded in 12-week program is a failed attempt for success because the demands can be so violent that injuries can, will and have occurred. 12 week weight loss or shredded programs are usually built to produce max efforts neurologically, in other words, get off the couch and push that sled with 90Lbs for 30 seconds, and kettlebell swing a 16kg bell for 30 sec, and throw up while performing 20+ burpees, and on and on and on it goes. Then, out of the blue, you experience your first lower back injury. Or you begin to feel a nagging pain in your knee that wasn’t there before. Not only are you in danger of soft tissue damage, but the central nervous system crash can be devastating, ultimately dropping immune function and a myriad of other issues that follow. Sustainable – The final reason why these programs are destined to fail, they just aren’t sustainable. Once asked what is the best diet to follow by a few clients; my answer was simple. “The one you can sustain.” But this goes for all things in life especially those chasing the 12-week program that will get them to the promised land as well as those changing diets like I change my underwear. Sustainability works well with consistency which equals success. Now generally this sounds like a no-brainer, but actually, there are a lot of trainers still trying to sell the dream, and people out there still trying to get their quick fix without developing the relationship and understanding of how to progress in their sport or in life. You have to find a sustainable medium in your training and be patient with the process, and I promise you success. 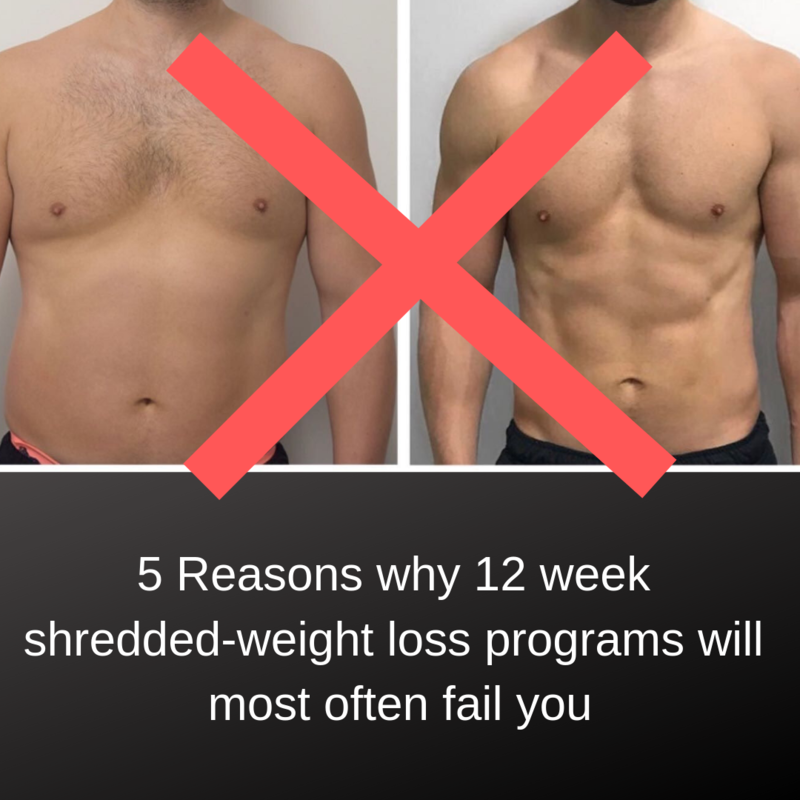 So, to quickly review let’s simplify the 5 reasons why 12-week weight loss or shredded programs are a failed attempt at results. Science proves that the healthiest way will get you similar results in 4 more weeks of training in a more holistic manner. There are possible hormonal dangers to dietary deficits and as well as overuse injuries to high rep ranges. Athletes need time to build adaptations to succeed in their sport, therefore long term training commitments are needed. There’s the danger of soft tissue damage or other injuries due to the demands of highly intense training demanded from 12-week programs. Finally they are unsustainable and anyone who’s ever gone through these types of training demands may show short term success, but usually, do not continue the intensity or the dietary deficits. I hope that this was helpful, I think that the world of training is changing slowly for the better, and I think that we’ll be seeing less and less of these kinds of trainers offering up silly 12-week promises. In the end, the reality is a simple commitment to oneself, and that is to try to sustain a holistic lifestyle that encompasses training, diet, recovery, sleep, and happiness. Yes, I said it, happiness. Sharing some happiness within your circle of friends and family, sharing a little love and raising a glass once in a while to toast the life we choose. So until next time, enjoy a glass of something tasty, take in the smells and flavors of a great meal, hug someone you love.